Darique Ruiz joined the BFL Apartments team in 2015. When he’s not working as a resident aide, Darique mentors kids in high school at a church downtown, and also has a keen interest in learning as many languages as he can. We caught up with Darique to talk about his journey with the agency, and his future goals. BFL: What led you to apply for work at BFL Apartments? Darique: My previous job referred me to the agency but what made me want to apply was that BFL appeared to be committed to helping the people that needed the most help and I wanted to be apart of something like that. BFL: Have there been ways you have grown or learned something new or unexpected on the job? 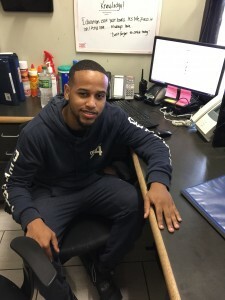 Darique: I always had a big personality and connecting to people came easy to me but I learned how to connect/relate with people with disabilities and mental health issues which is a great skill to have in a work setting but also in life. BFL: Have you faced challenges on the job, and how did you overcome those challenges? Darique: The biggest challenge I personally face is not being able to speak multiple languages but I have an amazing group of people I work with that I can always lean on so that road block became a speed bump. BFL: What do you do in your spare time? Any long range life goals? Darique: In my spare time I mentor kids in high school at a church downtown. My goal is to be a great influence to the kids today because the kids we connect with today will be the same people that are going to be connecting with the kids in the future. That’s life wise. Work wise I just want to continue helping people in need in any way I can. BFL: Any other goals to share? Darique: I grew up in the area BFLA is located at and because of that I have great ties with the community and the people living in it. My career goals consist of either working at a school (Middle school or High school) as a Physical Education Teacher or to continue to work for non for profit organizations that are committed to helping people in need.